Pashen’s Court, later corrupted to Patience Court, was a ‘court’ of five dwellings off South Street and at right angles to it, just a couple of buildings away from the junction with Stars Lane. It was named after George Pashen who was a linen draper of Kingstone, a preacher and one of the original trustees of the Tabernacle Chapel. He is listed in Pigot's trade directories of 1824 and 1830, possibly indicating that the court became known after him from about this time. He was also a member of the Vestry. George Pashen's signature against the Vestry minutes of 3 March 1831. The 1851 census listed five families living in Pashen’s Court, a total of 24 people comprising six men, twelve women and girls and six children. Of the men two were glovers, two farm labourers, one was a stone sawyer and the last was a blacksmith. All twelve of the women and girls were listed as glovers or glove sewers, the youngest being aged 11. These would have been glove factory 'outworkers' sewing and finishing gloves in their own homes. In December 1851, following a cholera epidemic in 1848-49, the Board of Health held a public enquiry headed by Dr Thomas Rammell, the Board’s inspector, into the public health and sanitary conditions of Yeovil town. Dr Tomkins, in giving evidence at the enquiry, cited Pashen’s Court as an example of poor hygiene where all the houses in the court shared one privy that was so close to the court’s well that it became contaminated. In 1896 as part of a ‘town improvement’ the Town Council closed Pashen’s Court. The site was developed as the Palace Theatre and, in turn, the later Gaumont cinema. 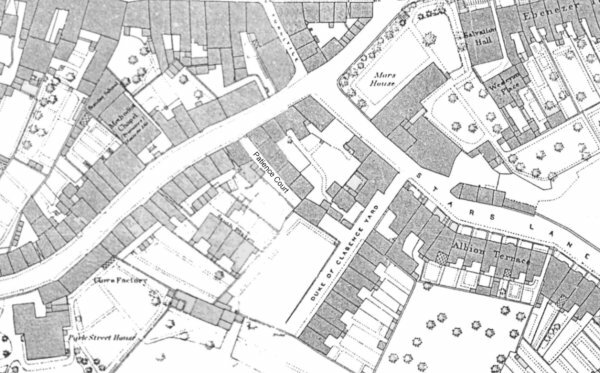 1886 Ordnance Survey showing Pashen's Court as Patience Court at centre.